After testing a couple of new features through its beta channel, SwiftKey announced a new update is available for Android users of its keyboard app. Aside from the usual list of new languages supported by SwiftKey, the developers confirmed the addition of new functionalities. 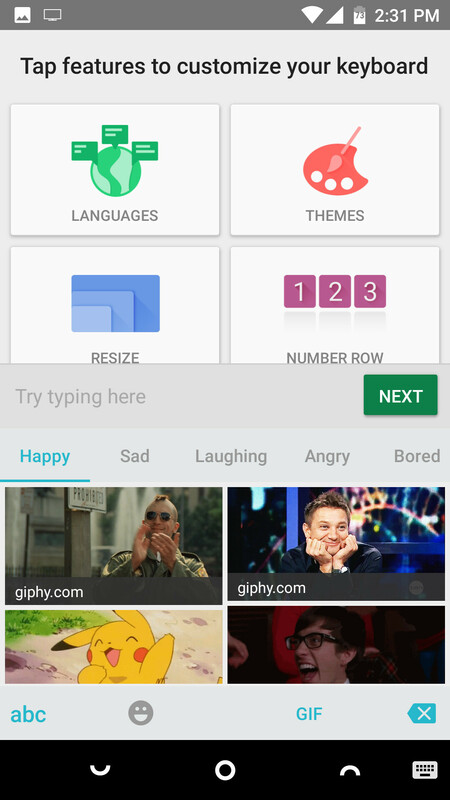 First off, SwitfKey for Android now supports GIFs, but only in categories. All GIFs can be accessed from the emoji panel in case you plan on using any. Then, there are new keyboard shortcuts for Bluetooth and hard keyboards. The new update adds support for Tamlish and Tamil transliteration. Also, transliteration is now supported in Bangla, Kannada, Malayalam, Marathi, Odia, Punjabi and Telugu. If you're part of SwiftKey's beta program, then you already benefit from most of these features. If not, you can update to the latest version that has just been released in the Google Play Store. Good news because I just removed this stupid app on my phone. This app kills productivity. They are completely different disrespectful only to add simple features like copy paste, select all. But they add useless things like gifs. Lack of Copy paste and select all? What do mean? Swype has a far better Cut, Copy, Paste set of shortcuts. I wish swiftkey would do the same thing. Edit. And Select All! I use swipe to A a lot.